System smart-sleep "Innovator". Smart blanket "Innovator". Personal non-material and proprietary rights to the invention belong to the author, and are protected according to the norms of the current legislation. For a complete set of the system, the smart sleep "Innovator" lacks a few more elements. The "Innovator" platform and the author of the original idea present to your investment attention the following element - a smart blanket "Innovator". Each element of the smart-sleep system "Innovator" has its own purpose. That smart blanket is endowed with several smart features. First of all, a smart blanket in its internal structure has a natural filler and inflatable elements. Inflatable elements can change the sizes of a blanket if necessary both in thickness, both in width and length. Compact and light compressors will not be visible to the user of this smart blanket. Secondly, the smart blanket has in its structure magnetic flexible elements that prevent the blanket from sliding off the bed during sleep, and not only. The internal movable, magnetic mechanism in the smart bed, in automatic mode, with the help of these same magnets can correct the blanket. Thirdly, the smart blanket has flexible light elements that can change the color of the light radiation depending on the programmed functions. Naturally, all these processes are controlled and programmed by the mobile application smart dream "Innovator". Also, the blanket will have several smart functions - built-in alarm clock, sensors that will determine your body's body temperature and its respiration rate. So, we have the following, but not the last, element of the smart-sleep system "Innovator" for your investment viewing. The idea is open both for investment and for full redemption. System smart-sleep "Innovator". The smart bed "Innovator". The main component of the complex smart-sleep "Innovator" is a smart bed "Innovator". This is the most high-tech part that includes both mechanical movements and electronic equipment with the appropriate software. And so, as previously spelled out in the project smart blankets "Innovator", mechanical movement smart beds with magnets, able to tighten and improve the smart blanket. This is a simple inner rails with magnetic tips, which "attract" the ends of the blankets , which are magnetic elements, and place the blanket in the desired position. To cover the bed will also be done in automatic mode. The smart bed has the ability to change its height and dimensions, again using mechanical components. Of course, all this is controlled by the user through the mobile application. Light colored lights works on the principle of ambient light - the less light, the higher light emission. And Vice versa. Mechanically it is possible to change the angles of the parts of the smart bed that is comfortable both in home and in medical environments. In a separate trim bed equipped with automatic air ionization and salt elements that positively affect during sleep. One of the main features is a built-in innovative device that is now being tested, which allows to suppress the surrounding noise. So silence of the sleep is assured. Systems smart-sleep "Innovator" is presented in full. Dear investors and krautheimer - study and participate in the development of this project. System smart-sleep "Innovator. 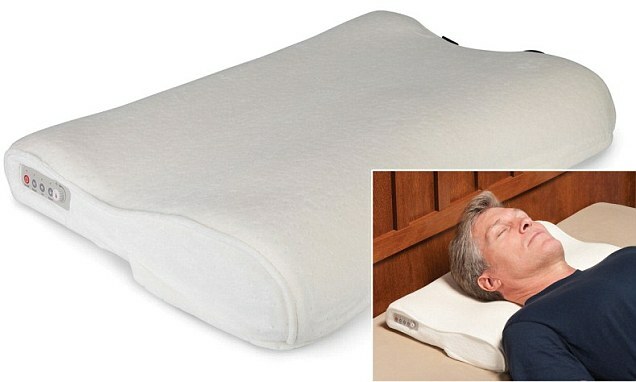 Smart pillow "Innovator". The idea is that the smart cushion, using a special safe coating while it is in use during sleeping or resting, assess the condition of the hair. The condition of the hair is evaluated by several parameters - the fat, the state of their purity, perhaps even brittle. The pillow involves a special application with the gadget, which displays all of the foregoing data. The convenience is that the user every day knows the state of his hair. The data, if desired, can be transferred to a personal hairdresser, who on the basis of these data will determine the types of hairdressing services that are acceptable to you at this time. Also, for convenience, on the road or on a journey, an optional cover for the smart cushion, which performs the same function. Just this case it is possible to put on any pillow, anywhere. Also additional functions of smart cushion will be available to its led backlight Wake up massager; built-in speaker and microphone, which will provide reception of incoming calls; function resize smart pillow using the built-in mini-compressor that will inflate or deflate it to suit the requirements of its user. And, of course, it will all be available using the mobile app. In the children's production version of the smart cushion "Innovator" will be available a number of parental control features. Quite unusual and strange at first glance, the title of the author's ideas, but moderation platform "Innovator" in the presentation, which will be provided below, will reveal all the main functionality of the idea. You can say at the beginning of the description that is sufficient investment and attractive idea and has good chances to become very popular among users of mobile and fixed gadgets and devices. So, mobile application, virtual mailing contact information "Innovator" is quite simple and clear functional service. Now in the list of rating photos, or in the field of buttons along with emoticons and alphanumeric panel is a separate button that holds contact information for a user. That is, when a new user downloads this app, makes your contact information as a phone number and ( or ) e-mail address, in an automatic manner, a new button with the existence contact information about the owner of this gadget it is placed on the instrument keypad. And then the user pressing a button can send as email or regular message, all my contact information. May also along with smiles, appreciating a particular photo, send your contact information. The man who along with my pictures and got someone's contact details, and absolutely understands just what can take advantage of this information and contact the user who sent him their contact details. This function can also use existing social networks and instant messengers on the terms of partnership. But, the main functional tool of this application is sending the user's contact information. As it would happen in a new user upon registration ( in the settings ) gives the right program to send the contact information to different methodological components. What's more important is that this service is linked to the profiles and accounts of the user in social networks and messengers, he uses and where he was. For example, having a profile in any social network, this mobile application is looking for similar contact information in your user with other users in the social network and send it to them. The user who received the notice in the form of contact information, will be happy to assess and action - reject it or use for Dating. It is also possible to continue to start sending these obtained contact information for your social circle to enlarge. So, now have their contact information functional control button, which is separate and independent from the gadget and whether your operating system. They are now always connected and ready for mailing. Also now they are partly a function of the evaluation of photographs. In this author's ideas will be presented an innovative mobile app that will work with the software car latest model years that are in your equipment already have a video camera installed. The functionality of this application is quite simple in its use and a brand new one that will allow you to start it in mass use. Below, in quite a short presentation, all will be described. Now, in modern cars, the last years of release, should have equipment that will allow you to match mobile phones and other gadgets with the car itself. It will also be necessary to register in the mobile app the car itself for the complete functioning of this startup. Also in the attachments there is already a front and back camera, camera circular review. All information about the operation of the cameras is transmitted to the screen or screens that are located in the interior of the car. That is not unimportant to note that the selfie-shooting is gaining more and more fans and expands its thematic aspects. And the author of this original idea combined all of this our everyday things in an innovative mobile app - automotive Seli "Innovator". The combination is that the user devices using the functionality of the application, connects to your existing car video cameras. The connection enables to activate the video camera and display the image on the screen of the gadget. That is, any user who will use this innovative application, while within the shooting car video cameras, will be able, through them, to make selfie-taking. Or normal shooting while in the vehicle or remotely, having an individual login code to a specific car registered in this application. In the opinion of the author and administration of the platform "Innovator", this startup has a great future and potential growth promotion. It is also expected a brand new fashion trend in selfie-culture. That is, we have a new, innovative, entertaining service to the individual character, which will allow you to extend the use of attachments, use of car and gadget user of this mobile application.